A good globalist or a bad one? The biggest challenge, when I talk to politicians about the free-market agenda, is convincing them that they should restrain the growth of government. To be more specific, I think they often understand and accept the argument that ever-rising fiscal burdens are bad for a nation’s economic and moral health, but they are afraid that voters and interest groups will kick them out of office if they reduce the size and scope of the public sector. I have a different challenge when talking to ordinary people about the free-market agenda. They’re quite comfortable (at least in theory) with the notion that it’s good to cap the growth of government spending, but there is a lot of skepticism about trade. And their doubts sometimes persist even after I share my eight questions and five charts showing the folly of protectionism. I grew up in Mexico City… Since then, I have lived in Chicago, London, Brussels, Jerusalem, New York and Hamburg. I suppose this makes me a “globalist” in certain eyes…To be a globalist means almost nothing — even “Davos Man” has to trundle home somewhere after the annual forum draws to a close. "Rex Tillerson is as much a globalist as Samantha Power. Ditto for John Bolton and John Kerry, Charles Koch and George Soros, Mike Pompeo and Julian Assange. A term that embraces opposites has almost no explanatory power." "Maybe it’s time now to make “globalist” mean something after all. An earlier generation of globalists — they called themselves internationalists — had learned the lessons of the 1930s and understood that the U.S. could not cut itself off from the world and expect to remain safe from it. All of that sounds very appealing. Especially when compared to what it means to be on the other side. 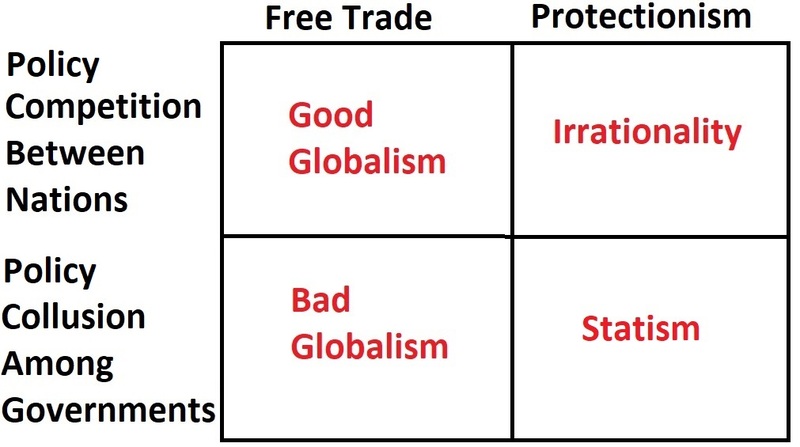 "To be an anti-globalist…does specify something. …In short, anti-globalism is economic illiteracy married to a conspiracy mind-set." ** Does globalism mean supporting the OECD’s efforts to undermine tax competition so that it’s easier for politicians to impose bad tax policy and more redistribution? ** Does globalism mean agreeing with the IMF’s support for bailouts and higher taxes, policies which arguably are only for the benefit of politically connected big banks? ** Does globalism mean adding regulatory harmonization to trade agreements, supplanting the much more market-friendly approach of mutual recognition? ** Does globalism mean signing onto agreements that give powers to unaccountable and corrupt international bureaucracies such as the United Nations? ** Does globalism mean siding with the European Commission in imposing one-size-fits-all rules for member nations notwithstanding the subsidiarity principle?